One of the exciting things about the world of wine these days is how many producers are breaking the so-called rules of winemaking. And some of them are even breaking the real rules laid down by authorities. Their efforts are good for us wine consumers because we can try so many new variations that wouldn’t be possible if everybody followed the rules. The Pasqua family in the Veneto region of northeast Italy is breaking rules like crazy. 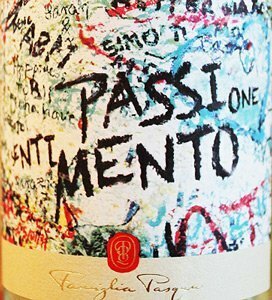 Their Passione Sentimento comes in a red and white version, ($15-17 each) and neither is anything like a standard wine from the region. Because of that they only get the IGT rating from the Veneto wine authorities, instead of the higher DOC or DOCG. “The Rosso breaks about 10 rules!” says Alessandro Pasqua, including a merlot-dominant blend, grape provenance, vinification timing (early), and aging regimen. As for the Bianco, the authorities don’t even have a category for a dry white made with raisined grapes. When I tried both the Rosso (red) and Bianco (white) I had no preconceived notions, which is rare because usually you have a general idea about what wine from a particular region will taste like. Both wines use partially dried grapes to concentrate flavors and aromas. That technique is used in the Veneto for Amerone, which can get quite expensive. I have never seen a wine this inexpensive that uses the appassimento technique. To use this method grapes must be hand-picked to avoid damaging the skins and to pick bunches where the grapes are spread out. Then the grapes spend three months drying out, during which the grapes lose 60 percent of their volume. 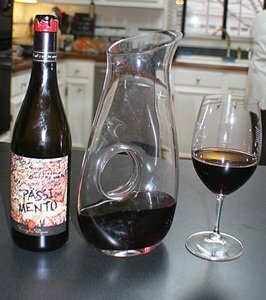 The Pasquas altered the technique slightly so the grapes lose only 15-30 percent of their volume. While you would never confuse the red with an Amarone, the taste is wonderful. The producers say it is the only dry red in the U.S. market made from 100 percent dried grapes that is neither a Valpolicella nor an Amarone. The blend is 40 percent merlot, 30 percent corvina and 30 percent croatina. Grapes are placed in small crates in the fruttaio (drying shed) for four to six weeks, until the grapes lose 15 to 30 percent of water content, depending on the vintage. The resulting extract exhibits a higher concentration of sugars, richer fruit, natural aromas and characteristics of the terroir. The wine ferments in separate steel tanks at a controlled temperature for 20 days. It then spends about three months in large cherry barrels. Then the wines are blended and go through malolactic fermentation to soften the wine. Vibrant, rounded, rich and lush, it exhibits the classic Amarone flavors of cherry, plum and spice on the palate, along with the appassimento-style slightly bitter almond finish with silky tannins. I liked this wine much better with food than as a sipper. I would serve it slightly chilled. The white version is believed to be the only dry white wine from the Veneto using appassimento. The wine is made from 100 perent Garganega (Gar-GAN-eh-gah) grapes. Early harvested, hand-picked grapes are dried for around 15 days, concentrating floral aromas and flavors. Following the crush, a 12-hour-plus maceration adds yet more structure and complexity. After fermentation in steel tanks, a portion is aged in French oak barrels for a few months. The wine is a gorgeous pale yellow in the glass, with pleasant aromas of peach, citrus and almond. The flavor profile is somewhere between a creamy chardonnay and the stone fruit, citrus and mineral notes of a sauvignon blanc. I think I would call the flavor slightly off dry. Serve it well chilled. I thought it was a delightful wine, and my wife Teri loved it. Winery: Founded in 1925 by brothers Riccardo, Natale and Umberto Pasqua, Famiglia Pasqua is now in its third generation of family control. Brothers Riccardo and Alessandro Pasqua assumed leadership of the winery in 2014 and have been shaking up their family business ever since. Their grandfather and his brothers started the winery after moving to Verona from the relatively poor area of Apulia. The wine became a household name in Italy with popularly-priced wine. Umberto Pasqua’s son Umberto then took the wines to elsewhere in Europe and other export markets. Umberto is now president and his sons Riccardo, 39, is CEO, and Alessandro, 34, is vice president Americas. The American market has been growing in importance to the company, accounting for a third of its sales, and Allessandro has moved to the United States. Pasqua controls 741 acres, about one third estate-owned. In 2007 the company moved to the village of San Felice, just outside of Verona and built a modern, environmentally friendly winery. Umberto and his sons now have total control of the company after buying out Umberto’s brothers. That allows them to move quickly when necessary. 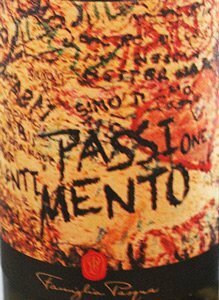 When the company released a new wine in 2014 it wanted to call the wine Passimento. Because it sounded too much like the appassimento technique, wine authorities would not allow the name. So the family called it Passione Sentimento (passion and feeling). The brand name is Romeo & Juliet. For the label of the Rosso and the Bianco released a year later, the company used a portion of the Romeo and Juliet wall in Verona that is filled with graffiti. About 3,000 messages are written on the 20-foot wall of Juliet’s house in Verona every day. The full name is on the label, but in really large letters what stands out among the grafitti is Passi..mento. Pasqua also makes 11 Minutes Rosé, Romeo & Juliet Passione Sentimento Prosecco DOC, Famiglia Pasqua Amarone della Valpolicella DOCG, Mai Dire Mai Valpolicella DOC and Mai Dire Mai Amarone della Valpolicella DOCG. The red was great with Sloppy Joe sandwiches. Goes with: We had the Bianco with takeout Chinese food, which presents challenges for wine pairing. The hint of sweetness helped make this wine perfect for the combination of spicy and sweet in our food choices. I had Kung Pao Chicken, chicken fried rice and an egg roll. Teri had General Tso’s Chicken combination plate. The wine was a very nice complement to all three of my dishes, even the egg roll with sweet duck sauce. Teri loved her pairing as well. 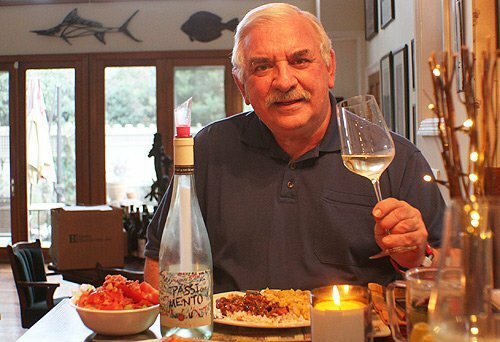 This wine would pair well with most seafood and with some dishes not friendly to wine, such as chicken tacos, barbecued chicken or even a cheese pizza. We drank the Rosso with a quick mid-week meal of Sloppy Joes. 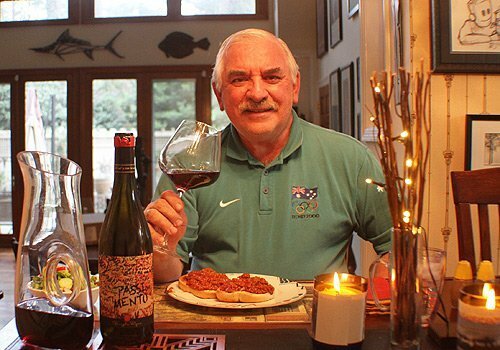 I loved the way the cherry and plum flavors of the wine mixed nicely with the spices in the Sloppy Joes. It also would pair well with hamburgers, ribs, most grilled red meats, pasta with meat or tomato sauce and aged cheeses. The white was perfect with Chinese food.